Empty stomachs are craving the new Halloween movie something fierce, especially after several critics screened the sequel at TIFF, reporting back with mostly positive reviews. Some have called it The Force Awakens of the slasher genre. Most dig it. The movie got a standing ovation following its premiere, and fans are pumped. Now comes a new trailer that features never-before-seen footage of Michael Myers in action, to help fuel the anticipation. This latest sneak peek was thrown together by Universal Pictures and Blumhouse, then given to Mexico-based theater chain Cinemex as an exclusive. The quick, yet hard hitting clip, features a new introduction from Halloween franchise creator and master of horror John Carpenter. He is joined by original Halloween star and returning cast member Jamie Lee Curtis. Both seem genuinely excited about their upcoming movie, which Carpenter scored and produced. He says this in his intro. "Hi, Cinemex moviegoers. I'm John Carpenter. 40 years ago, I made a movie so terrifying that it became an influential horror film. See the terrifying [new] film in cinemas October 2018." John Carpenter passes the intro over to his once and future leading lady. Jamie Lee Curtis has this to say. "I'm Jamie Lee Curtis. 40 years later, I return to play Laurie Strode, who has been turned into a warrior hellbent on protecting her family at all costs and keeping Michael Myers locked away forever." 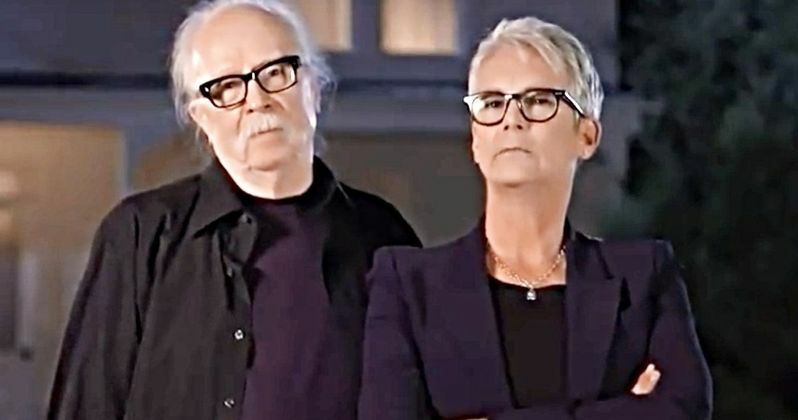 John Carpenter and Jamie Lee Curtis end their introduction with a dare to see what is being called one of 2018's scariest movies. David Gordon Green directs what is a direct sequel to the 1978 original, with a script he co-write with Danny McBride. The unseen footage included in this new foreign trailer features a better look at Michael's scarred eye, which he got from Laurie in the first movie, after she jabbed him with a coat hanger. It's up to Laurie to take out Michael's other eye this Halloween as the pair face off in the ultimate grudge match that has been 40 years in the making. Their final confrontation is sure to be full of exciting moments that will have you on the edge of our seat. Jamie Lee Curtis is joined in the movie by Judy Greer, who is playing Strode's estranged daughter, Karen, and Andi Matichak, who plays Laurie's granddaughter Allyson. All three generations of Strode women will have their own personal moment to contend with Michael Myers, and one or more of them might not make it back. Halloween will slash its way into theaters starting October 19. This trailer, provided by Joseph97 on Youtube, is unique in that it also incorporates some old footage from the original Halloween to get those nostalgia bumps goosing. You can check out the latest footage here, just beware. It is scary. You might not have the nerve to keep going, once you get to that big moment where Michael and Laurie come face-to-face four decades later. Its almost too much for the heart to take.